Rovi is a Gold Star Medalist of the Inner Magic Circle and a Member of the International Brotherhood of Magicians. 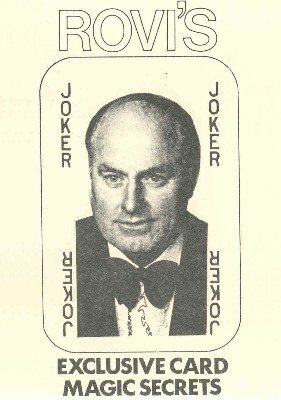 He is an expert with a pack of cards and his particular brand of card magic has an enormous impact on magicians and members of the public. In this exclusive interview he has been persuaded to release several of his remarkable effects. Featured in this recording are some of the card secrets that have earned Rovi regular engagements on TV and at exclusive hotels and private houses. The secrets he reveals are not for magicians out to amaze each other with manual dexterity but for those who genuinely wish to baffle and entertain with cards. Rovi has a fast mind and a quick wit and this recording is entertainment and instruction from beginning to end.